You need a very small amount per application. Makes my hair so soft I can’t style it. 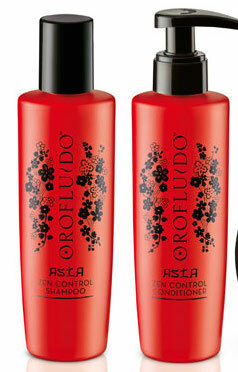 Orofluido is a favourite of this blog, so when their new Asia series came out this summer we were all excited. Containing camellia oil, bamboo extract and rice oil, the line promises to make your hair more soft, adding elasticity and making it easier to work with. Camillia translates to tsubaki in Japanese, and the oil can be used for both body and hair. Discovering a new natural ingredient with a miracle reputation made me extra excited about this new line. I have short coloured hair and here is my verdict: it just makes your hair “too soft”, your hair feels like the hair of a newborn chicken, ultra super soft…and therefore very hard to style. Having short hair I rely on the tons of products to keep my hair in shape, and they just don’t work as well when my hair is like down. Also, it takes a long time to wash out, but on the other hand you really need a small amount per wash, which makes a bottle last for ages. If your hair craves to be ultra soft this combo could be the right thing for you, otherwise check out out other reviews of great products for you hair. To participate you have to leave your email adress in the commentary field of this post. The competition is open worldwide. It ends on the 1st of september. The winner will be contacted by email. It is a plus if you like us on facebook.